Mayor Mufi Hannemann will talk in New York City on Monday about the city's test of a new emergency communications system. Honolulu was one of five cities chosen to test a system that allows different agencies to talk to one another. The city's current system does not allow for that. "An effective interoperability system would allow our Honolulu Fire Department, police department, emergency services paramedics, Oahu Civil Defense officials and the mayor's office to communicate with each other via computer," Hannemann said yesterday. The other cities chosen to test the program were Amsterdam, Singapore, New York and Los Angeles. From there, the mayor will travel to Washington, D.C., where he will attend a conference Thursday aimed at helping at-risk youth. KAILUA-KONA » Manuka State Park and part of the Manuka Natural Area Reserve near the southern end of the Big Island will be closed Monday through Friday and Nov. 7-10 to combat coqui frogs, state officials said. Control efforts are feasible in the area because the populations of frogs there are isolated, said Department of Land and Natural Resources Chairman Peter Young. Researchers achieved 89 percent frog reduction at treatment plots in Manuka in May, but a lack of resources prevented a follow-up and frog numbers rebounded. This time a follow-up will be done two weeks after the initial treatment, and additional treatments will be done later, the department said. 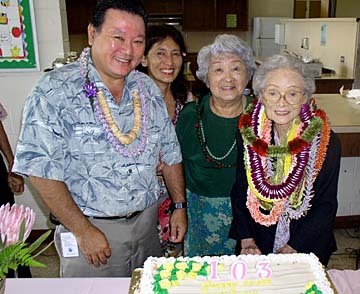 COURTESY OF MAUI ECONOMIC OPPORTUNITY INC.
About 50 friends and relatives helped Shichi Watanabe, right, celebrate her 103rd birthday on Maui yesterday. Watanabe,, who came from Japan's Fukushima prefecture to work in the sugarcane fields, opened a barber shop with her husband, Kinpachi, in Wailuku in 1926 and operated it for 29 years. Her daughter Lillian Maeda, second from right, attributed her mother's longevity in part to living in a close-knit family of four generations. Also in attendance at the Velma M. Santos Community Center was Maui Mayor Alan Arakawa and Watanabe's granddaughter Amy Maeda. » Hawaii Pacific University's student-produced video "50 Years of Rebuilding Lives Together, for the Rehabilitation Hospital of the Pacific, has received the Gold Award from the international Aurora Awards and the Crystal Award of Excellence from the Communicator Awards 2004 Video Competition. Jacqueline Langley, HPU communications instructor, Mark Nitta, communication video lab manager, and a team of students made the video. » Toyota-Hawaii has presented $336,300 in educational supply certificates to 255 public schools, 188 private and 18 home-schoolers across the state via its "On Board for Education" program. Customers who bought certain vehicles during the 2005-2006 school year were able to chose which schools or individuals received the $200 certificates, redeemable at Education Works and Easy Music Center. » Kamehameha Schools has recognized three individuals who made lifetime contributions to the school and community, with its most distinguished Order of Ke Ali'i Pauahi Awards. They are the late Dr. George Hueu Sanford Kanahele, a respected author, historian and researcher; Augusta Helen "Gussie" Lihu'enuiahanakalani Rankin Bento, a quilter and feather lei maker; and Fred Kekaokalani Cachola Jr., an educator, innovator and Hawaiian cultural authority. » The Hawaii Association of Broadcasters Inc. has awarded more than $60,000 in academic scholarships to Hawaii Pacific University, the University of Hawaii-Manoa and 25 students at large. » Named to the board of directors of the Institute for Human Services are Christopher J. Benjamin, vice president and chief financial officer of Alexander & Baldwin Inc.; Karl Essig, advisory director of Morgan Stanley; and Michael T. Jones, division president of D.R. Horton -- Schuler Division. » Morris Nakamura of Ewa Beach has received the Muscular Dystrophy Association's 2005 Personal Achievement Award for Hawaii. He was a carpenter until neuromuscular disabilities forced him to retire. He became a volunteer for advocacy organizations that help those with disabilities. An avid painter, Nakamura has donated his oils for fund-raisers. » Mike McKenna was named National Dealer of the Year by the American International Automobile Dealers Association. He has donated more than 25 free cars as door prizes for Hawaii high school Project Grad events, and is approaching his personal goal of donating $1 million to schools in the state. » KahBo Dye-Chiew, an attorney with Goodsill, Anderson Quinn & Stifel LLP, has been named chairperson of the Hawaii chapter of the American Immigration Lawyers Association, which serves Hawaii and Guam. Taking Notice also runs on Tuesdays and Thursdays. Cameras recorded a couple suspected of a robbery at the Prince Kuhio Plaza. 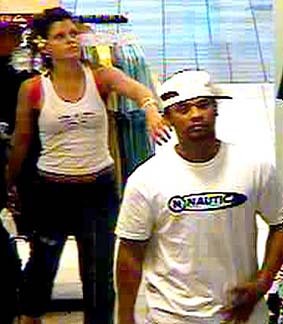 Big Island police want help identifying a couple who may have been involved in a robbery at the Prince Kuhio Plaza in Hilo in June. Store security cameras recorded clear pictures of both suspects. The man was described as being about 5 feet 8 inches tall, between 160 and 175 pounds, with a dark complexion, dark hair and apparently in his early to middle 20s. The female was only described by police as being his companion. Anyone with information on either suspect is asked to call Detective Richard Sherlock at 961-2379 or the police nonemergency number at 935-3311. Callers may also dial Crime- Stoppers at (808) 961-8300 in Hilo or (808) 329-8181 in Kona. Police are looking for a man who allegedly robbed a Kalihi sewing store last week. The suspect allegedly confronted a woman working at Kathy Andaoag's Sewing Store at 912 Gulick Ave. on Oct. 13 at 9:50 a.m., pointed a handgun at her and demanded money. After receiving an undisclosed amount of cash, he fled toward King Street. He is described as being in his 30s, 5 feet 2 inches tall, about 120 pounds, with black neck-length hair. He was last seen wearing an orange T-shirt, dark-colored long pants, a black baseball cap, dark sunglasses and carrying a black backpack and dark-colored handgun. Anyone with information about this case is asked to call CrimeStoppers at 955-8300 or by dialing *CRIME on a cellular phone.